This is your chance to talk real-time to Jean and me -- I'm planning to be on the simegen.com server's IRC chat for New Year's at 1 PM Mountain Standard Time (USA) on SUNDAY, JANUARY 2, 2011. Please note the new time change, below. In many cases, more detailed explanations of these awards, with lists of previous winners, can be found on the main Awards page (http://www.simegen.com/sgfandom/awards). You can see these by following links from the one-liner page, above. So anyone who's on our lists or deals with us in any way is more than welcome to sit in, nominate, vote, and chat. We run it in two simultaneous IRC chatrooms -- so you can split your screen in half. One screen is moderated during the business meeting so the log is easier to clean up. The other screen is just chatter. Then both "rooms" are opened so everyone can talk to each other and just party. Previous chat logs can be found at www.simegen.com/sgfandom/chats/ if you want to take a look. Karen will gladly help OFF LIST to get you connected to the chat. Some help, though perhaps not quite current, is also found on http://www.simegen.com/techtools/ where tutorials can be found. Wildside Press has now released MOLT BROTHER and CITY OF A MILLION LEGENDS on Kindle, Nook, Apple, and all the new e-book formats. They are still available on Fictionwise.com PLUS in paper if you want new copies. HOUSE OF ZEOR just went to press -- there will be ebook in all those formats, PLUS new paper POD on acid free paper. UNTO ZEOR, FOREVER has been turned in, and will be back for proofing soon. We'll let you know when, but it will hit all formats as well. 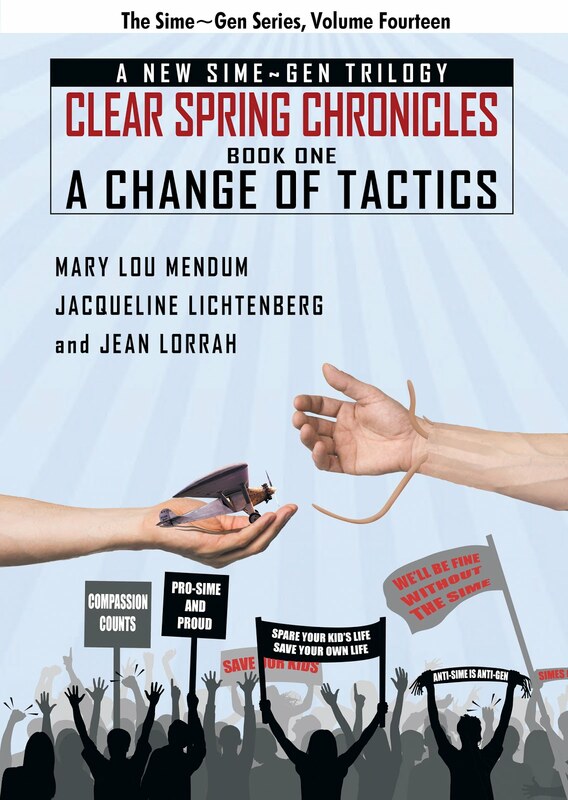 Here's a the link to use that goes to the Jacqueline Lichtenberg titles on Amazon. If you can copy, paste and delete the carriage returns, use this link to buy anything on amazon and Sime~Gen Inc. gets a few cents toward our server fees. And Jean's SAVAGE EMPIRE will be available too. Here's the link to Jean Lorrah's titles -- where you will find her Sime~Gen as soon as it comes available. Our Lists aren't functioning well due to the spam load, so until we can move the server and get new List software, you can interact with us by dropping a note on the whatsnew.simegen.com blog or via facebook, twitter or any service you prefer. I'm currently working on MAHOGANY TRINROSE. I'm using the files that Karen MacLeod proofed up for Meisha Merlin before they collapsed. We have turned in PERSONAL RECOGNIZANCE (my new Sime~Gen story set in the most modern setting yet) and 3 of Jean's Zhag and Tonyo stories for a DOUBLE - (like the old Ace Doubles) - printed back to back in the same volume. We'll let you know when they come out. All the Sime~Gen works (INCLUDING THE FARRIS CHANNEL) are now under contract to the Borgo imprint of Wildside Press, a slick modern operation that will make them available everywhere in every format -- EXCEPT in brick-n-mortar stores. Have you been reading my blog, The House of Keon, at http://www.houseofkeon.blogspot.com/ ? It's about my various travels, and is currently about my recent visits to places of interest near home--what I call a semi-staycation. Well, until I go somewhere else, or unless and until photos from more of my earlier travels turn up, I will soon run out of material and leave that blog standing with all my previous posts. Next time I travel, I will of course add to that blog, but that probably won't be until summer 2011. 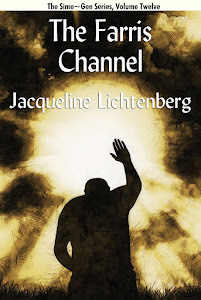 Amazon.com has made Author Pages for Jacqueline http://www.amazon.com/Jacqueline-Lichtenberg/e/B000APV900/ref=sr_tc_2_0?qid=1274145159&sr=1-2-ent and me http://www.amazon.com/Jean-Lorrah/e/B000APACX0/ref=sr_tc_2_0?qid=1274145011&sr=1-2-ent . Both pages are incomplete, not listing all the books we have available on the site, and neither has any comments or discussion going on. Still, they are available. More Amazon news: Amazon.com has just--without warning--eliminated all ebook downloads other than Kindle. The downside is that you can no longer download the ebooks of Jacqueline or my books that had been available, or the Nessie's Grotto books by Lois Wickstrom and me (you can still get the latter at Fictionwise). The upside is that Blood Will Tell and my four Star Trek novels have suddenly developed Kindle editions. You can find an ongoing series of Jean's new essays, Secrets of Fiction Writing, at http://ezinearticles.com/?expert=Jean_Lorrah. There are eleven articles up, and I just turned in the twelfth yesterday. I hope to produce approximately one a week. These articles can be read directly on the Ezine Article website, or ezines are free to reprint them as long as they follow the Ezine Article rules. COAL FOR CHRISTMAS by Lois Wickstrom and Jean Lorrah has been named an Official Selection in the KIDS FIRST! Film and Video Festival. reviews staff are several books behind. We are eagerly and actively seeking new people to review for us. As with all of Sime~Gen, our reviewers are volunteers. When they write a review, it is posted with their byline, and they get to keep the review copy of the books they have read and reviewed. by Sime~Gen Inc. and all rights are reserved..